My son turned 7 in March and he wanted a kite. No big deal, right? Well, the truth is, I had never flown a kite in my life and I wasn’t all that eager to start now, when the only running I do these days involves chasing Roy around the house to put pants on him. Also, this is embarrassing to admit, but I’m a disaster when I handle any sort of string or wires. It’s like some kind of curse where everything I touch turns out hopelessly tangled. In the end, I get so worked up I become a mindless beast, hissing and snarling at inanimate objects. It’s not a pretty sight. In fact, if it wasn’t for my wife, who must have some kind of super power when it comes to unknotting my messes, I’d probably still be screaming at our Christmas tree lights from last December. So when Roy said he wanted a kite for his birthday, I couldn’t help shuddering. I mean, a kite is practically all string, isn’t it? Yes, there’s that kite part, too, I guess, but the only thing I could think of at that moment was string—all that awful string. Still, I tried to be an adult about this, a good father, and so I agreed: we bought him a big, fancy kite, and after he unwrapped it, I promptly hid the box in a corner of my office, hoping he would soon forget about it. But he didn’t. Unlike his chores around the house, he didn’t forget about the kite. In fact, each weekend he would chirp: Can we fly the kite? Can we fly the kite? Fortunately, I had a reasonable-sounding excuse every weekend for the past two months, but it was only a matter of time, really, before I’d either have to face that kite or flee the house and never return. Well, I got as far as packing my underwear before I decided: No, Adam, you’re a grown man. You can do this—you can fly that scary-looking kite. So I wrote it down on my calendar for last weekend (in a nervous, shaking hand): Fly that scary-looking kite. On Saturday morning, before the kids woke up, I bravely opened the box and pulled out the big, fancy kite. I then spent a horribly long time trying to figure out how to put the thing together. I hadn’t even tried to fly it yet, and there I was, already cursing at it under my breath. 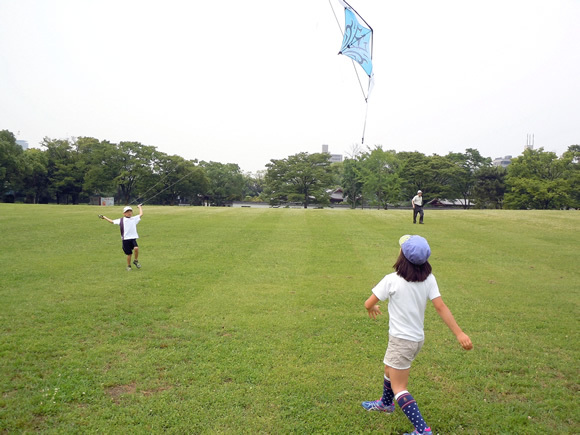 After breakfast, the kids and I piled into the car (the kite was now brooding in the back), and we drove to a big park in the center of Hiroshima. I parked on the street, alongside the park, then led Roy and Lulu to a wide, grassy area. It was still early, so very few people were there, and we had plenty of space to run around. Despite my fears, I was determined to stay positive, hopeful. In fact, I had a grand vision of getting that kite flying high in the sky, my kids whooping with excitement, their eyes shining at me in admiration. That stubborn kite refused to stay aloft for more than five seconds, quickly crashing to the ground, again and again. At one point—as this re-created image clearly shows—I even got tangled up in the string and it dived back down and tried to murder me. So our little outing was a huge failure. But here’s the thing: it was a failure in the minority language. Naturally, we’d all much rather experience successes than failures, but when time for the minority language is limited, even the failures are successes, in a way. The important thing is taking that time, making that effort, to provide as much language exposure as we realistically can—perhaps even when it’s an experience we would normally avoid. In hindsight, I was doing a disservice to my own aims for my children’s bilingual ability by avoiding our outing with the kite. I’ll try to remember this next time when my kids ask me to do something, and my first impulse is to decline. I just hope Roy won’t be asking me to fly that kite. How about you? 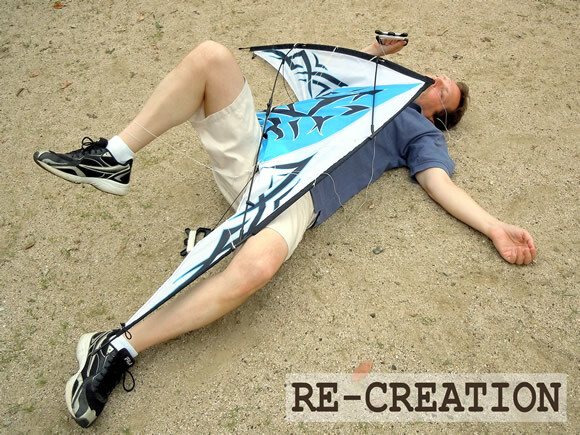 Have you almost gotten killed flying a kite? Any experience, bad or good, can become source material for the minority language. Yesterday for example, the 6-year-old girl I teach accidentally punched me in the face as she was leaping over her skipping rope. A bloody lip and an ice pack later, her English vocabulary had probably increased by about 10-20 words. After all, words like “punch, swollen, puffy, ice pack” aren’t the kind of words you’d hear on an everyday basis, especially when the lessons only last two hours! Heather, I’m sorry to hear this! But well done, making use of the mishap to your student’s advantage! Hope you’re feeling fine soon!